Have you ever stopped to think about what happens when orphans age out of an orphanage in 3rd world countries like Haiti? The orphans in Haiti at age 18, who have grown up in an orphanage are now on their own. Even if they are one of the rare Haitian students that finishes their high school education, there are very few jobs they will be able to get. Only 5% of Haitians that graduate high school will go on to college. Unfortunately, many of the teens from orphanages will become prostitutes (female and male), turn to gangs, or resort to begging just to survive. Beyond Relief is very pleased to partner with Northwest Haiti Christian Mission (NWHCM) to give twenty-one 15-17 year old orphans an opportunity to receive vocational training before they turn 18. Through this partnership they will have job skills that will enable them to make a living and provide for themselves when it is time to leave the orphanage. Meet Esther. She is 17 and currently lives in the NWHCM orphanage. She is taking the English class at the Beyond Relief Trade School and hopes to become a doctor someday. For now she learns English so that she can work as an interpreter at the mission. The trade school includes teaching medical terminology so future interpreters can have a good understanding for working with the medical teams that go to Haiti to work at NWHCM. An interpreter that knows medical terms is a huge help to the doctors and nurses that are there to help so many Haitians. In February an eye team from the US was at the mission and used many Beyond Relief graduates as their interpreters. Who knows what having this skill will lead to for Esther. Maybe someday her dream of becoming a doctor will be realized because of working with medical teams. Beyond Relief is giving these teens a fighting chance to move into adulthood with job skills and self confidence that they can have a better life. This is helping orphans that are no longer little, but who will soon be adults, reach their highest potential. We need YOUR help, though, to keep making this possible. The trade school is funded 95% through generous donations from people who have a heart for helping those in need. The school currently has almost 200 students. If we can get just 100 scholarships at $35 a month, that will cover the cost of running the school. We still need 65. Would you consider providing one of those scholarships? Maybe you would be able to provide a one-time donation toward the ongoing construction of the building. One hundred percent of the building structure has been completed!! We have classrooms for all of the classes, but there is still a lot that needs to be done. The permanent, cement roof needs to be added to the south side of the building, there are windows and doors that still need to be put in, the permanent electric wiring still needs to be run and the permanent bathrooms still need to be added. We are amazed at how quickly God has helped us get this far with the construction, but we still have work to do. 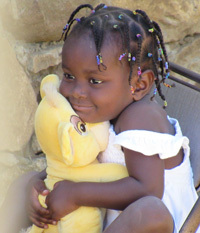 Donate online at www.GoBeyondRelief.org or mail to P.O. Box 156 Rossford, OH 43460. Thank you for your financial support and for your prayers! P.S. A team of 3 or us were in Haiti in February. We got to work with the English class for 3 days. (They love to hear Americans talk.) We did role play working on medical terminology and read through a Bible story to work on pronunciation. The students were anxious to learn and all have dreams for their futures. Please help us make those dreams a possibility.